Just a quick note to say I've updated my portfolio. Unlike previous incarnations of my portfolio, for this round I decided to try something completely new. First, I retired all of the images in my previous portfolio. While my old book included some of my very favorite concert images, I wanted a clean break so that I could clearly define the display of new work without past influence. Next, I decided to limit myself to images from the last few months, drawing entirely from my most recent events to show the freshest images. So, what made the cut? You can see the resulting 18 images here. As a concise statement about yourself as a photographer, one's portfolio is an essential part of communicating your vision and your capabilities. If you're interested in refreshing your portfolio, or looking to create one for the first time, check out my 8 Tips for a Great Photography Portfolio. Good choice of photographs. Nice Portfolio! i see a photo of chester bennington and jonas brothers! i was really excited to see that you are going to projekt revolution because they were not touring canada this year so i was really disappointed so i have been looking forward of your photos! Hey Jessie, I actually just photographed Projekt Revolution – that shot of Chester is from last week. Thanks for the comment. Hey Keath, SDC put on a killer show. Absolutely tremendous, they all us photogs in the pit shooting with big grins on our faces. I’d say they were easily in my top three bands to photograph at Projekt Revolution. Hey Margarita, thank you! BTW, it was nice to meet you at Lollapalooza! I just noticed you are going to the All Time Low show as well and you have two shows listed that day, how are you going to do that? That’s a bridge I’m going to have to cross when I get to it. Followed from your buzznet bulletin to here. The Jonas Brothers!! Definitely wasn’t expecting that one. But as the name suggests, you shoot shows and i suppose you’re non discriminatory against what band at what show. Ha. Are your ears okay? I hope they didnt get blown out by all the fangirls. Hi Rosalie! Yes, the Jonas Brothers, right along side NIN and the likes of Slipknot. I used to only photograph bands I listened to, like many music photographers, but now I’m happy to photograph anyone, anywhere if it promises to be a good show. Earplugs were a huge necessity for that show, those 20,000 screaming girls would have done a number on my ears otherwise. I still can’t work out how you can be so good on ultrawide angle shots! Anytime I mount my 18mm I end up with a mostly black frame! I love wideangles but cannot really go below 28 to get a decent shot. Ultra-wide shots are tricky, since the field of view is so extreme. My technique? Get in close. If there’s too much black, you’re not close enough! portfolio looks great dude, well done. Thanks, Jason. I appreciate the feedback! just LOVE this photo you have up here. who’s the performer? Hey John, this is Scott Weiland of the Stone Temple Pilots. 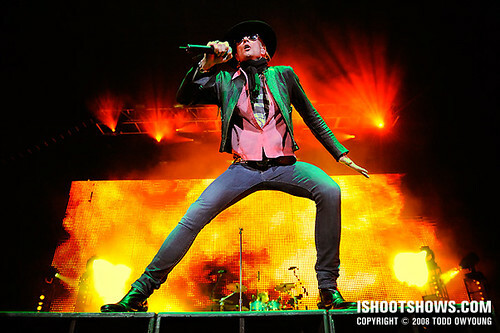 Weiland was also lead frontman for Velvet Revolver until his recent split with that band.